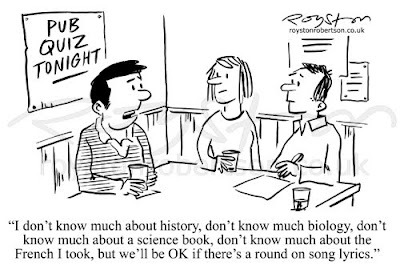 This cartoon is the Beat the Cartoonist drawing in the April issue of Reader's Digest. 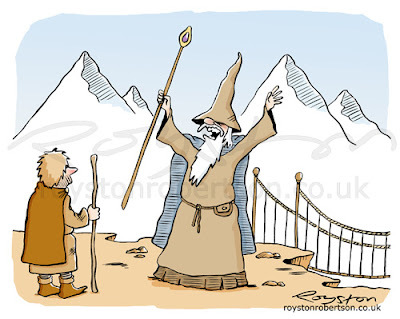 The theme for April's Shrewsbury Cartoon Festival is "Magic, Myth and Mystery" and this cartoon would have fitted in nicely, but I came up with it after the deadline for exhibition entries had passed. As the new Doctor Who begins his spell in the Tardis this weekend (as no-one in the UK can fail to have noticed) I thought I'd dig out this old chestnut for my series on rejected cartoons. This is from 2006 when Private Eye were running lots of gags punning on the TV series Grumpy Old Men (Grumpy Old Mister Men, Morris Men, that kind of thing). This happens from time to time, there was a series of iPod puns when the gadgets became popular (here's a published one) and a couple of years ago, for some reason, they favoured "Are you looking at my bird?" gags. I usually submit one or two for these themes, as they are easy to think up, but the problem is they are almost impossible to sell anywhere else if rejected. The Cartoonists' Club of Great Britain is 50 years old on Thursday. We celebrated at the weekend with a party, lots of food and drink, and a very big cake. It took place in the pub off London's Fleet Street where it all began (well, actually a pub which stands on the site of the pub where it all began, but that doesn't sound quite as good!) on April Fool’s Day, appropriately for cartoonists, 1960. 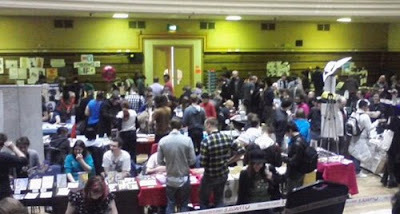 I made a cartoony weekend of it, meeting up with fellow cartoonists to attend the UK Web and Mini Comix Thing, above, where I spent much more money than planned, as well as the brilliant Ronald Searle at 90 exhibition at the Cartoon Museum. On Friday I also checked out the smaller Searle show at the Chris Beetles Gallery and went to see Exit Through the Gift Shop, the excellent film by Banksy, the street artist and, some would say, a cartoonist writ large (see above example from the Banksy website). 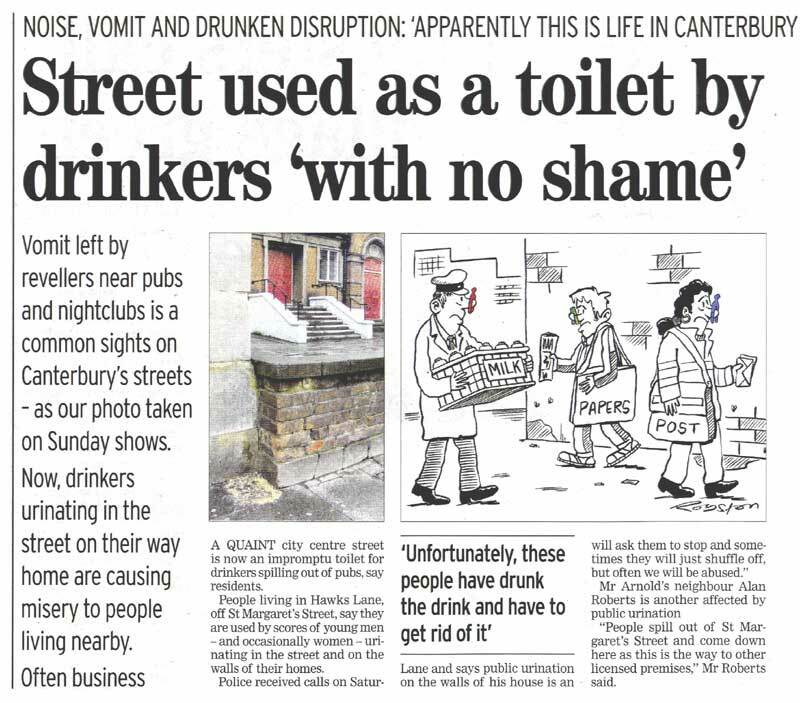 I think, on balance, that contributing to this particular report was probably more rewarding for me than for the poor snapper who had to tread the streets to find a pile of vomit to photograph. Click image to enlarge (if you haven't just eaten). 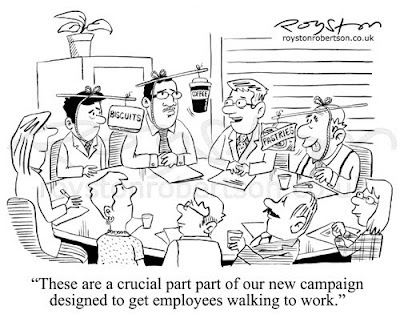 "These are a crucial part of our new campaign designed to get employees walking to work." 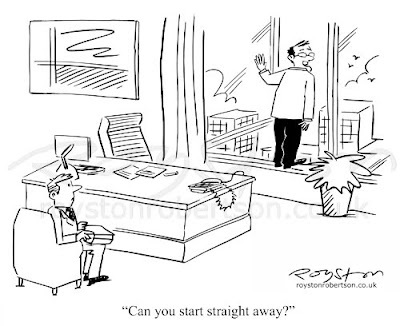 Here is another in the series of boardroom cartoons which I've drawn regularly for a business publication since 2003. Click to enlarge. I just got a new mobile phone which that lets you take and email photos. Yes, I know, several years after everyone else. 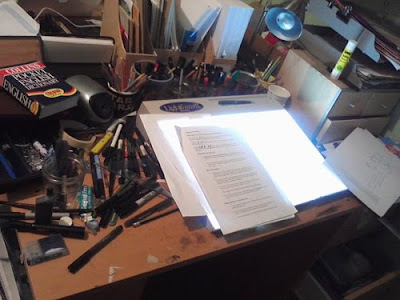 Anyway, it makes it easier to do one of those posts that are popular in the blogosphere, where I show you around the converted attic room that I can't quite bring myself to call a studio. So here goes. 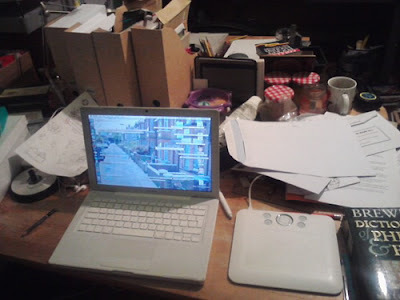 Labels: Who lives in a mess like this? "To deter vandals, I'm doing my own graffiti." When you do on-spec cartooning you soon build up quite a bank of gag cartoons. This means that when someone wants a cartoon on a particular subject, you can pull one from the files. 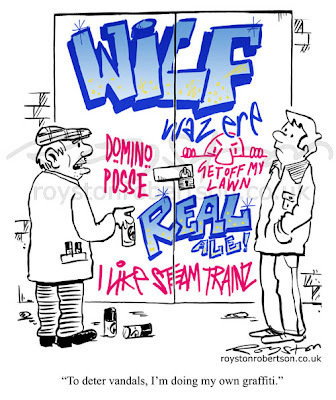 So this cartoon, which was languishing in the rejected file, was taken by a client to illustrate an article about graffiti – which was nice, as I spent a fair bit of time on the graffiti when I drew it originally! Originally the old guy was "Alf", rather than "Wilf", as that was my Grandad's name and it strikes me as the perfect name for an old-man character. But then I thought people might take the "ALF" as standing for the Animal Liberation Front, which could confuse matters. "Let the machine get it." I've played it fairly safe, so far, with this series of rejected cartoons, showing either gags that came close at a magazine, with some encouraging noises, or ones that have got a good reaction when shown to colleagues and friends. This one never came close, and I don't think I've ever shown it to anyone else. 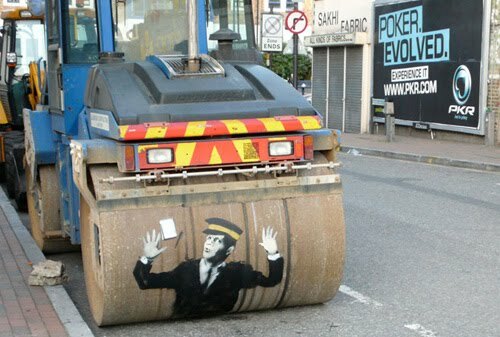 It's just one that amuses me! 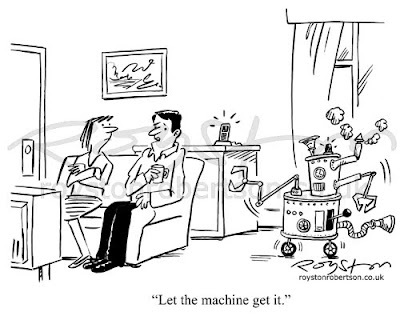 I'll often use the phrase "Let the machine get it" if I don't want to be disturbed when the phone rings, and I just liked the idea that you would have some kind of steam-driven machine that potters around the house doing chores. The absurdity of it appeals to me and I had fun drawing the machine (I confess, I made whirring and whooshing noises to myself, in an Oliver Postgate style, as I drew it!) But maybe it's just me. Comments welcome, as ever. Click here to see all of the Not Yet Sold cartoons. 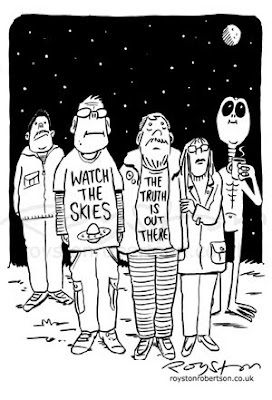 "Sorry mate, you'll have to ask someone else, I'm not from this area ..."
This cartoon was drawn for a local paper to illustrate a story about declassified documents on UFO sightings. 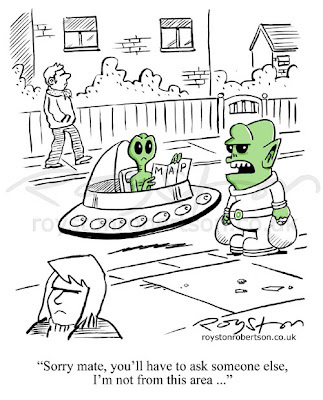 The Kent papers I draw for often seem to have stories about alleged alien visitors! That's fine by me, as it's always a good subject for humour. Here's another one from a few years ago. "Can you start straight away?" This is one from 2006 that got a good reaction from people who saw it. 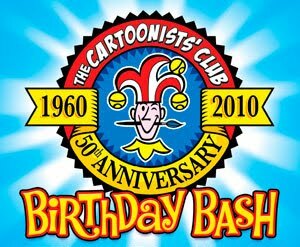 It was in the Cartoonists' Club newsletter The Jester (though I was editor at the time!) 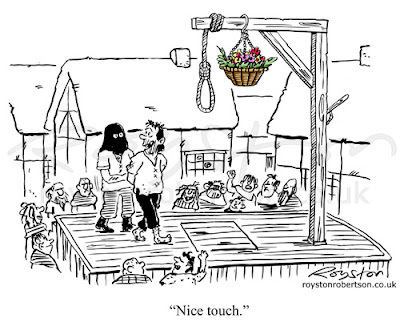 and it won a cartoon of the week contest on an internet forum. But, as you can guess from its inclusion in this feature, it was oft-declined by paying markets. Click here for all Not Yet Sold (don't mention the R word!) cartoons. 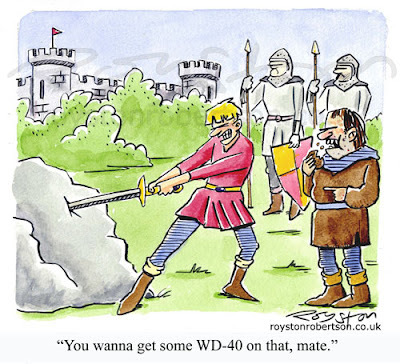 "You wanna get some WD-40 on that, mate." The Shrewsbury International Cartoon Festival takes place next month, and the theme this year is Magic, Myth and Mystery. This is one of the cartoons I submitted for exhibition. The Bloghorn, as well as drawing a few cartoons, of course. In the run-up to the big event, we'll be posting Shrewsbury stuff on the blog every Friday. We got the ball rolling today. This is the seventh festival, and the fifth time I've attended. 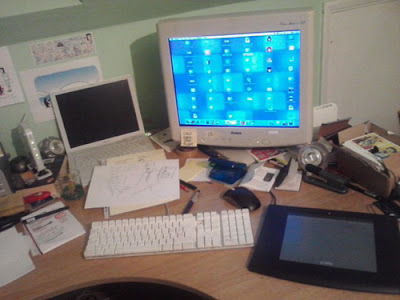 Here's what I got up to last year, and in 2008, 2007 and 2006. Or click this link for all Shrewsbury-related posts. As you will probably have heard, the UK edition of Reader's Digest is in administration, and they are looking for a buyer. The March issue is out now as usual though, so why not buy it to show your support? There's another cartoon by me in it, and some great gags from Huw Aaron, Rob Murray, Alexander Matthews, Steve Way, Peter "Pak" King, and Simon Meyrick-Jones. And you can have a go at the next Beat the Cartoonist, which is drawn by my cartooning pal Wilbur Dawbarn. 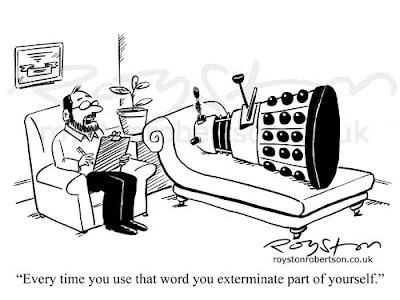 "Every time you use that word you exterminate part of yourself." Here's number 2 in my exclusive new part-work series Not Yet Sold, which builds week-by-week into a chronicle of blind hope and failure. 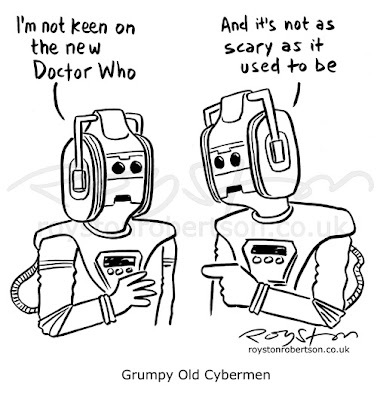 This rejected cartoon from 2007 is one of many Dalek gags I've done over the years (click Daleks in labels below to see a few) but I thought this one had a bit more substance as it's not just a joke about the usual Doctor Who/Dalek cliches (climbing stairs, hiding behind the sofa etc). Alas, it has been submitted to many magazines, with no luck. As ever, feedback and constructive criticism on the Not Yet Sold cartoons (or any on the blog) is welcome and, indeed, encouraged.